Welcome to Truly Anointed Scarves and Praise Dance Attire's online store. ***Important: Please complete the below form to ensure product availability PRIOR to submitting online orders. Ordering well in advance of your ministry date will ensure there is ample time for order processing and delivery. Order processing time is dependent upon current availability. We cannot guarantee estimated delivery times will coincide with ministry dates. All web orders must be processed online. We currently do not accept orders by phone or email. Please check back periodically for product additions and updates. Please feel free to contact us if you have questions about our products or if you are looking for a specific color or design. We will make every effort to accommodate all requests. E-mail us at info@trulyanointedscarves.com. ***Because our custom-made praise dance apparel is made-to-order, we ask that you contact us via email to confirm pricing, sizing, color, and fabric specifications prior to ordering. ***Note: It is not necessary to create a PayPal account to place an online order. 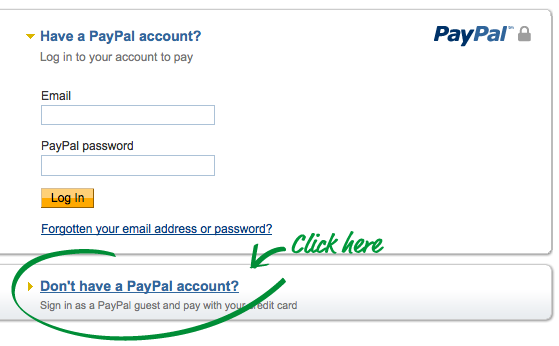 You may pay with a credit card by clicking the "Don't have a PayPal account?" link upon reaching the Order Summary page - as shown in the screenshot below. Company policies may be viewed by clicking the "Customer Service" link below.